I knew there was a reason I packed my hiking boots. After my three week fling with Sydney, I felt like I needed to get out of the city. Luckily, for a mere $8 you can jump on a two-hour train journey to the Blue Mountains. As soon as I touched down in Sydney I was inundated with flyers of day trips to the Blue Mountains. Originally, this was my plan. Sure, the pictures looked beautiful but a mountain is a mountain is a mountain, right? But then I started to do some research and I realised that a six hour jaunt was never, ever going to cover what the Blue Mountains have to offer. 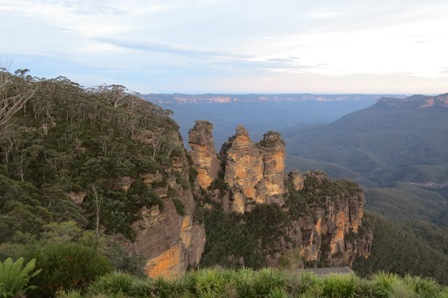 On my first day in Katoomba, I did what 97% of visitors to the Blue Mountains do: Echo Point. I was armed with a map I’d pilfered from a previous hostel, a single bottle of water and my camera. Echo Point is gloriously touristy, full of the one day tour groups taking photos of the Three Sisters, arguably the most famous view in the Blue Mountains. It was oddly busy but, me being me, I put this down to the fact that it was a Saturday. I decided that, seeing as I had walked to Echo Point and it was only about midday, I might as well go for a little stroll so I didn’t waste the day. 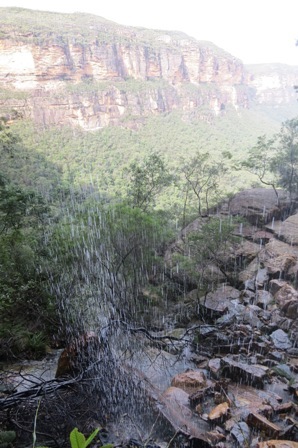 Let me tell you something: There is no such thing as a stroll in the Blue Mountains. And this is how I inadvertently went on a five hour bushwalk, in the middle of the North Face 100km run (hence the cheering – not just extraordinarily friendly Aussies) wearing a pair of ratty canvas pumps. Don’t get me wrong, it was a beautiful walk and I took approximately one million pictures of everything around me. I clambered down the Grand Stairway, a staircase that hugs the Three Sisters, and followed the Federal Pass staring in wonder at lush plants, avoiding the crazy runners that plummeted past me at regular intervals, and listening for the unreal sounds of the birds. 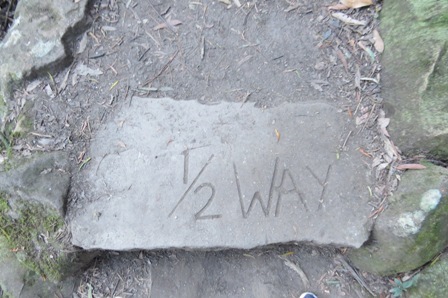 It wasn’t long until I found myself at the Furber Steps. 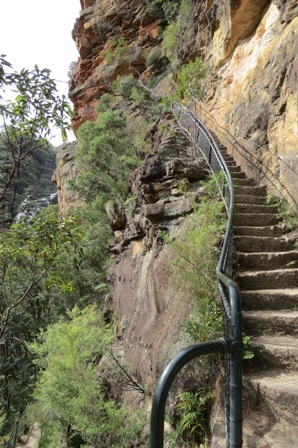 I had had every intention of taking the Scenic World Railway back up to Katoomba Falls to round off a pleasant walk. But I must’ve missed a turning somewhere because I was suddenly facing a rather steep set of steps, leading up, up, up the cliff face. At this point I was out of water, my feet were throbbing and I was still being lapped by people who had already run 60k and were still going. I accepted my fate and hauled myself up. It must have been because I look like a worldly adventurer who climbs valleys before breakfast every day and not because my face was the colour of a raspberry and I was almost heaving up a lung. If you’re ever tempted to do the Blue Mountains, stay a few days. I was only supposed to be there for three but ended up extending my visit for one more night because there was so much I wanted to do. And even with three full days there, I feel like I only saw about a quarter of what it has to offer. But take my advice: Make sure you always carry water, proper hiking boots and Tim Tams, just in case you end up on an inadvertent hike down a mountain because what goes down must, unfortunately, go back up. This entry was posted in Travel and tagged on the run on my own, sydney, travel. Bookmark the permalink.